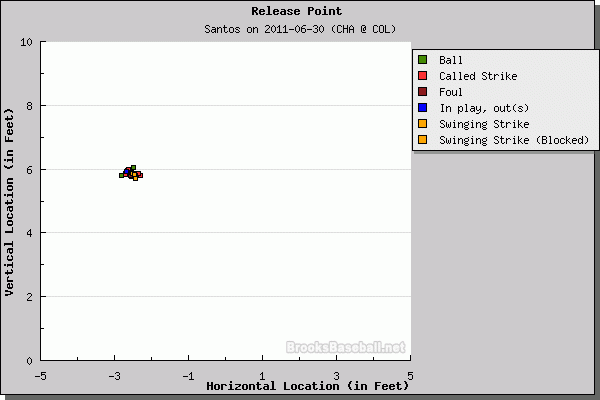 Sergio Santos eases up on the slider. Gets strikes on his fastball too. Will today’s Juan Pierre heroics ensure he gets to chance to do more damage? J.J. takes a look. Good game by Beckham too. RE24: Gordon Beckham 3.47, Juan Pierre 1.10, A.J. Pierzynski 1.06, Adam Dunn -1.86, Omar Vizquel -1.27. For video highlights go here or here or click the video tab here. He plans to play Adam Dunn at right field again. Last time he got away with it with Dunn getting one ball hit to him only. Manager Ozzie Guillen then said that Dunn might play in two of the three games this weekend, once for Konerko and once for Carlos Quentin in right. White Sox right-hander Terry Doyle, who threw his first complete game in the Carolina League earlier this year, used his opportunity this week to toss his first shutout, pulling off the feat in his fourth Double-A outing. Pitching against Tennessee on Sunday, Doyle allowed two doubles, a single and two walks but kept the Smokies away from the plate. He struck out four, and his Southern League ERA dipped down to 2.67 over his 27 innings at the new level. Doyle’s stats look very very good: in 27.0 innings in AA he has a 20 K / 5 BB ratio, a 1.18 WHIP, a 2.67 ERA and a 3.06 FIP. Looks like a bright spot in the White Sox barren minor-league system. If he keeps this up for the rest of the year, he should get a shot to make the team in Spring Training next year. BTW, here’s a cool article about how Doyle substitutes as a math teacher in the winter due to an encounter with dermatitis in his right hand index and middle fingers in 2007. The dermatitis cleared up, but the math teaching remains! More on the teaching here. As if Adam Dunn’s head wasn’t messed up enough, he just got schooled on the golf course by the team psychologist. Other White Sox links: J.J. says Jake Peavy doesn’t belong to the bullpen and puts on his GM hat, James identifies the White Sox All-Star players, FutureSox recaps the moves in thew Sox minor league system, John Danks’ MRI reveled only a mild strain of his right obligue and he’s expected to return after one rehab assignment, Patrick Newman at Fangraphs recaps Herm Schneider’s greatest hits, and Joe Posnanski says 2011’s Adam Dunn is the least exciting player ever. The move isn’t believed to be the result of any stress in negotiations between the Sox and Walker’s family. The Sox hold Walker’s negotiating rights through Aug. 15. Walker signed a letter of intent to play at Utah next spring. I see the ABL finishes on August 3. Sarris @ Fangraphs: Carlos Quentin: Best Ever? Some players make their name for prodigious power and hit home runs in five consecutive games like Paul Konerko. Other players are known more for their feet and steal bags in four straight like Juan Pierre did earlier this year. But, among these great luminaries of our time, there is one White Sox player who threatens to be the best ever at what he does: Carlos Quentin. That’s right, in more than 2,200 plate appearances, Quentin is already threatening the top of a certain leaderboard. …. A seventh-round pick last year out of Oral Roberts, Saladino opened plenty of eyes after signing by hitting an impressive .309/.397/.442 in 47 Low-A games. A broken hand delayed his 2011 season, and there were worries that last summer was a fluke when he hit .182 in his first 20 Carolina League games. Since then, he’s back to being the player we saw last summer; with two home runs over the weekend, he’s hitting .329 in his last 18 games to up his season averages to .252/.333/.476. Beyond having well above-average power for a middle infielder, he’s also a legitimate shortstop who makes up for average range with instincts and fundamentals. He entered the year as my 12th-best prospect in a weak White Sox system, and he’ll surely get a full write-up this offseason. And he’s doing this having a normal .294 BABIP. Last year his BABIP was an astronomical .412. 1. How frequently do batters experience such a sharp ISO decline from an established level? Other White Sox links: J.J. says Viciedo will help but he won’t save the offense, James doesn’t sound very enthusiastic after attending Friday’s game and recaps the past week, Fangraphs’ Eric Seidman says player milestones, like 500 home runs, might not result in hall of fame election, and Steve Stone says the 6-man rotation isn’t good for Gavin Floyd.